Small wonder Alvin Queen sounds so happy, speaking from his home in Geneva. The New York-born drummer has just spent his 58th birthday doing something he cherishes: photographing the magnificent Swiss Alps. A resident of Switzerland for nearly 30 years now, the accomplished drummer, bandleader and Nilva label founder reports that life is good abroad-very good, indeed. 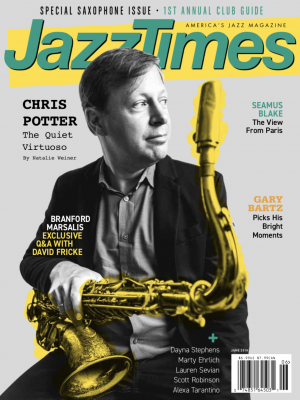 True, he’s never enjoyed the sort of recognition many less gifted jazz artists have received, despite a remarkably prolific career on both sides of the Atlantic. 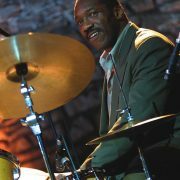 His résumé is chockablock with impressive credits, including collaborations with Oscar Peterson, Horace Silver, George Benson, Ruth Brown, Don Pullen, Stanley Cowell, Pharoah Sanders, Randy Weston and Charles Tolliver, among many others. But Queen is keenly aware that in many ways he’s led a charmed life, and he’s delighted by a welcome turn of events. Just a Memory, a subsidiary of Justin Time Records, has reissued two enjoyable albums he recorded in the ’80s for his enterprising Nilva label: Jammin’ Uptown, a Queen-led session featuring Manny Boyd, John Hicks, Terence Blanchard, Robin Eubanks and Ray Drummond; and Soul Connection, an aptly titled smoker sparked by the late Hammond B3 organist John Patton, backed by Queen, Grachan Moncur III, Grant Reed and Melvin Sparks. Couple these albums, previously unavailable on CD, with Queen’s recent Enja release, I Ain’t Looking at You, a soulful, contemporary session that generously showcases Terell Stafford, Jesse Davis, Mike LeDonne and Peter Bernstein, and it’s easy to appreciate the drummer’s sunny outlook. For a while there, it seemed as if the Nilva catalog-roughly a dozen-and-a-half albums in all-would never see the light of the digital age. Queen put the label on hold in the early ’90s, after more than a decade of operation, when distribution problems appeared insurmountable. The Nilva story continues to unfold, however, and Queen has plans for additional reissues. The next release, Ashanti, became so popular it helped boost sales of its predecessor. Says Queen, “That’s when I decided to go on and record different albums with Junior Mance, Charles Davis, Ray Drummond and Bill Saxton. By the early ’80s, Queen was already living in Europe, but the Nilva sessions were recorded at Minot Studios in White Plains, N.Y. On one level, Queen explains, he saw Nilva as a way to rekindle the passions of his youth. Though upbeat by nature, Queen is still coming to grips with the recent deaths of two close friends and collaborators: Oscar Peterson and Niels-Henning Ørsted Pedersen. Indeed, bassist Pedersen was responsible for helping Queen land gigs with two renowned trios, one led by Peterson, the other by Kenny Drew Sr.
Of course, approval came from others, and it came very early on. A musical prodigy, Queen grew up in Mount Vernon, N.Y., supported by a family that shared his interests. Andy Lalino, who owned a local drum studio, took Queen under his wing, serving as educator, urban guide and manager. Lalino often brought his young charge to Roseland, where the pre-teen soon distinguished himself as a wunderkind during a Gretsch Drum Night showcase, playing alongside Mel Lewis, Art Blakey, Max Roach, Charlie Persip and Elvin Jones. Thanks to Lalino, Queen also became a regular at the Apollo Theater, where he first heard the John Coltrane Quartet. Jones had “adopted” Queen following their appearance together at Roseland, and shortly after arriving at Birdland that night, the phenom from Mount Vernon suddenly found himself onstage. As a young professional, Queen loved playing in and around New York City, partly because he was respected in a highly competitive market. (“If you couldn’t play, you’d have another tryout every three or four years. Everybody knew it-the word went out.”) The experience primed him for playing on tour with major artists, including memorable stints with Silver and Benson. In time, though, Queen became frustrated with the lack of recording offers, among other things, so following his visits to Europe with Charles Tolliver in the early ’70s he began weighing his options. “I had tried so hard and I thought I can’t do no worse, so I took off for Europe,” recalls Queen. “Things began to change and I worked all the time. Paris, Nice, Geneva-wherever there was a demand for me.” He was welcomed, and sometimes put up, by a large family of jazz and blues expatriates that included Kenny Clarke, Art Taylor, Memphis Slim and Champion Jack Dupree. Eventually settling in Switzerland, the drummer has never regretted the career move.